What's this? Gloriously nerdy folk metal from the mystical land of Syracuse, New York? Fronted by my good friend Dan Barbour, radio host and writer extraordinaire? Well, that's kind of awesome. 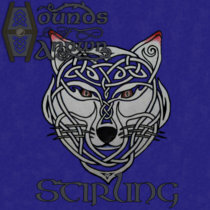 After years of work Hounds of Annwn finally have been able to put out their first EP, the two song Stirling an album that shows tons of potential and mystical metal promise. Inspired by Scottish and Irish folk music, Hounds of Annwn seem to reach for something older, and deeper in their sound. Toss in touches of sea shanties (And thus a splash of Alestorm) and you start to get a grasp for the glory of this band. These guys are creating music that is not only melodic and poignant, but also powerful on a more emotional level. The lyrics are often rather narmy, and almost reminiscent of DragonLance like at times (Which is definitely a good thing). Surprisingly addictive and filled with all sorts of tasty musical twists and turns I'm excited to hear a full length release from Hounds of Annwn. As for now, I foresee a killer cassette release with Contorted Records coming out soon!